班级： 学案主人： 主备： 备课组长审核： 学科组长审核： 课题： Unit 1 Can you play the guitar? *单词guitar,sing,swim,dance,draw,chess,speak,join,club; *短语：play chess/soccer,speak English/Chinese; *重要句型：----Can Sb. do sth.? 二、句型 ----Can Sb. do sth.? A.No, I can——Can you swim? ’t B. Yes,I can. C.No,I can. D.Yes, I can——______________.I think it’’t s easy. 2.Alice is English. She _____ English. 课题： Unit 1 Can you play the guitar? ( )1.My brother can ________.So he wants to join the ____club. *句型：-----Can you play the violin?-----No,I can’t. 【复习回顾】英汉互译： play the drums______________ 弹吉他___________ play the piano __________ 拉小提琴 _______________ 【自学】翻译： 喜欢做某事_________ play games with sb. ____________ the old people’s home___________call sb. at +号码_________ be in___________ 唱歌跳舞 ___________ help with sports_________ 【自教】 一、单词； 二、阅读P5的2a,2b,完成2a,2b,2c。 三、完成P6:3a,3b. 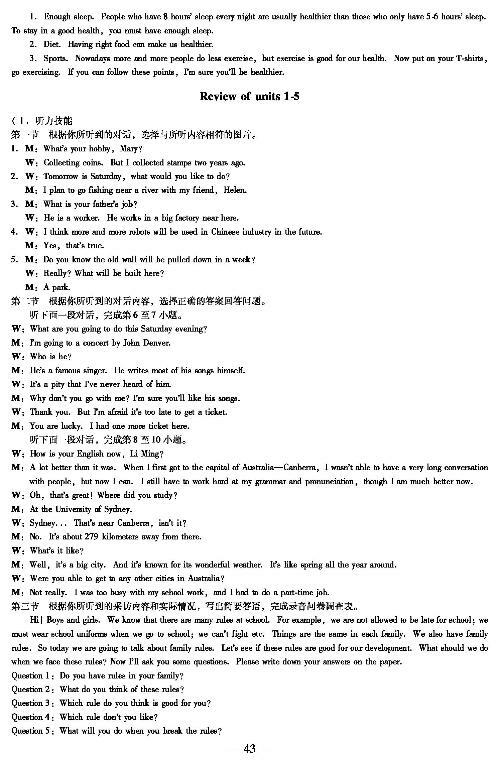 【自测】翻译句子： Do you have time on the weekend? Oh, his uncle can____(speak)Chinese and English. Look!This is_____(we)math teacher,Miss Liu. In Mr.Jones’room,we can see two old______(piano). My sister really wants to join the________(swim) club. My brother is a great___________(music).